Interval	: Poems Based on Bach's "Goldberg Variations"
Winner of the 2014 Nicholas Schaffner Award for Music in Literature. In this series of poems responding to Johann Sebastian Bach's spectacular "Goldberg Variations," New Hampshire State Poet Laureate Alice B. Fogel has paid homage to a 274-year-old masterpiece and, with the theme of spirit and embodiment that music-and life itself-evoke, has rendered from it a luminous new interpretation. Bach created the Goldbergs' 32 sections using nearly all the styles of western European music at the time; Fogel responds in kind with a range of contemporary poetic styles, including narrative, lyric, and experimental, all confined within the 32-line structure she has borrowed from the composer's 32-bar format. Interval mimics the "baroque" effects of overlapping melodies and harmonies by layering sound, syntax, and sense in multiple voices exploring self, identity, and being. In capturing the essence of this iconic masterpiece, through these poems Fogel has created her own music. 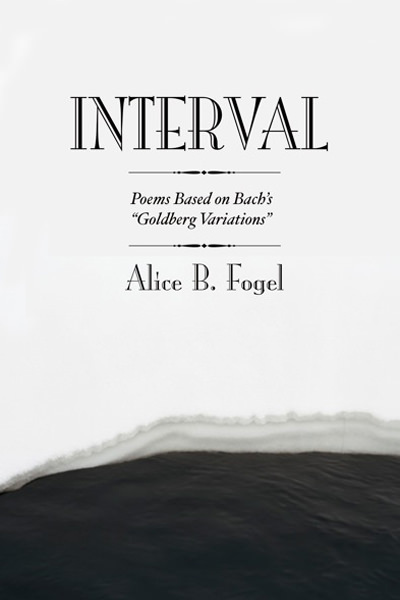 "Alice Fogel's Interval is a marvel of poetic discipline that mines Bach's Goldberg Variations for formal inspiration. While the project has a mathematically precise conception, the poems have the feel of meditative inquiry--intense, introspective and info"
"Brilliant. An ambitious impression of the Variations [using] many of that work's structural elements, as well as addressing Bach's themes and the deeper implications of what music can say of spirit and human-ness. [Interval's] language has a fluid, beauti"
"[Fogel's poems pay] attention to how one thing becomes another in the sense of transformation. . . . This creates a sort of dance-like, fugue-like quality in her poems where one form or state of being turns into another before our astonished eyes. Hence t"
Baron Wormser	Poet Laureate of Maine, Author of "Scattered Chapters" and "The Road Washes Out in Spring: A Poet's Memoir of Living off the Grid." "One can see the dance of intellect from word to word [as she] dramatize[s] the complexities of consciousness." "Multi-dimensional. With each subsequent reading you notice some detail you didn't see before, and the way she shapes meaning with words adds to the layered feeling of her lush pieces, like elaborately pieced, intricately stitched quilts." "Fogel has a gift for bringing the most subtle states of being and awareness into language." "NYTimes Parenting Blogsite: I did it again the next night, and then more than occasionally, branching out ...into Alice B. Fogel's "Interval" as well. They were just enough, those poems, they perfectly occupied the space I had at the time for words and th"